Sometimes simple is perfect. That’s what I did today. Something that looks so beautiful, you might be thinking it took me hours. Well I’ll tell ya it only took me about 20 minutes, the hard part for me was how to arrange the flowers. 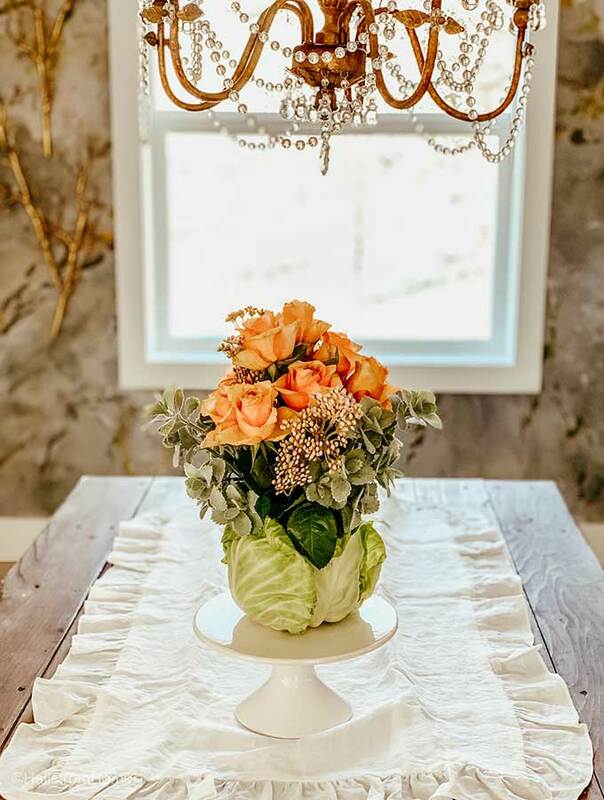 Since Spring is here that means Mother’s Day is right around the corner, so there in nothing better than a DIY Cabbage Flower Arrangement. 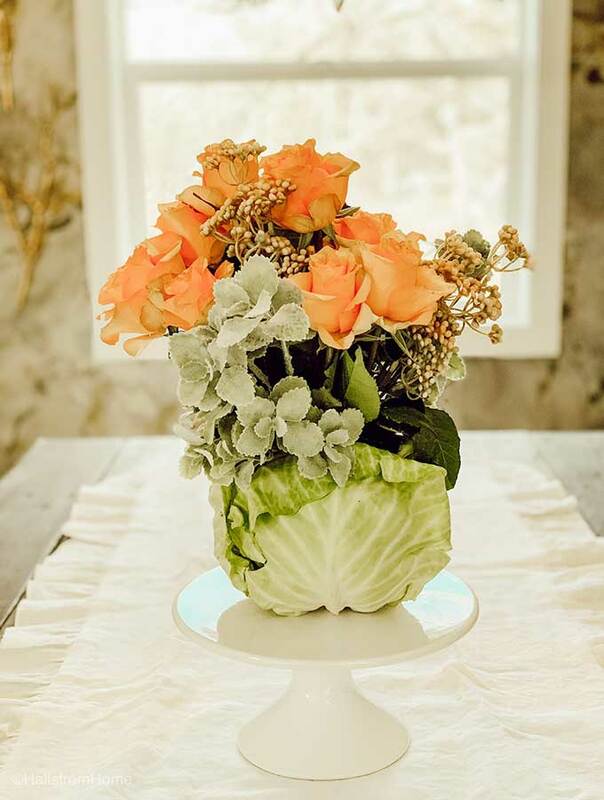 This cabbage arrangement doesn’t have to be used just for Mother’s Day, it is also perfect for a Spring tablescape! Since it’s about time for Spring outdoor dining a floral arrangement is what we all need. One day I was on Pinterest and found some inspiration, but looking at it I thought this could be pretty tough. Boy was I wrong. 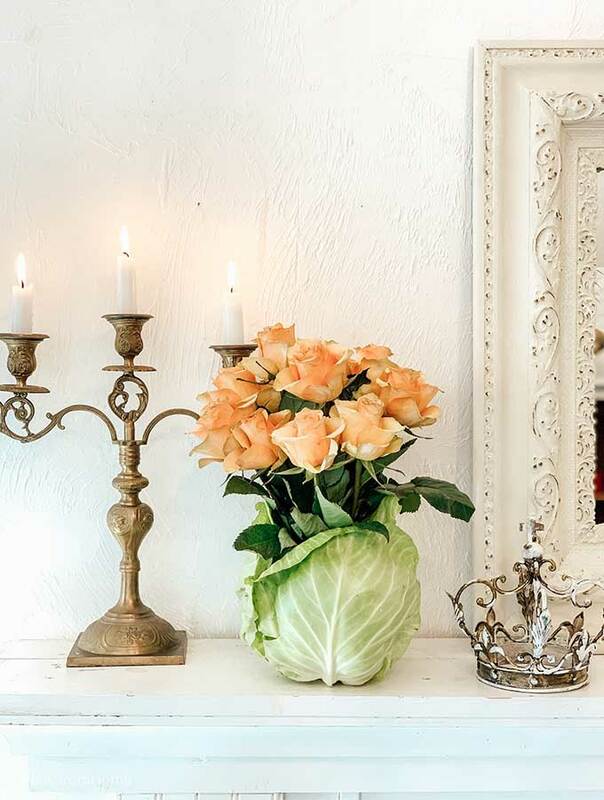 Easy peasy, so keep on reading to find out how you can create your own cabbage arrangement. 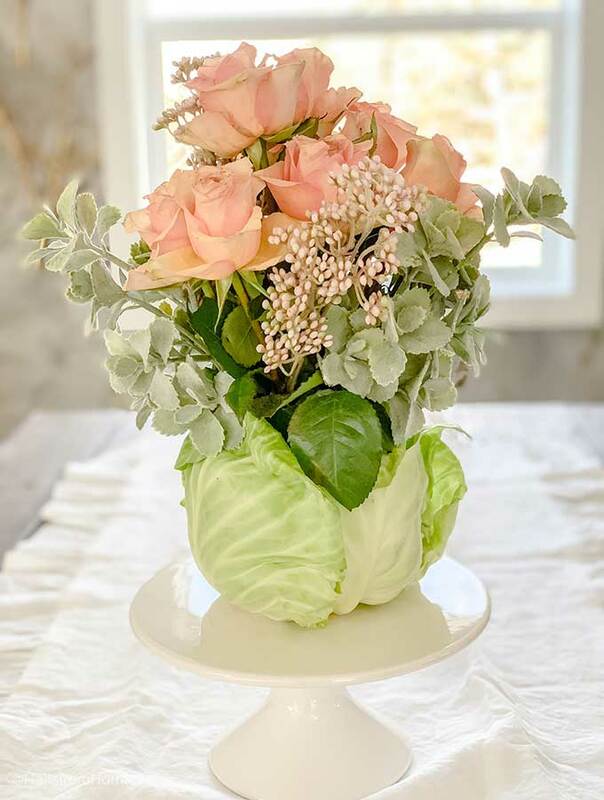 I will also answer a few frequently asked questions about the cabbage flower arrangement. Start with your cabbage. First cut a circle with a paring knife that would fit small canning jar. Then you’ll want to choose your florals. Next choose your filler greenery. Now it’s time to arrange your bouquet. 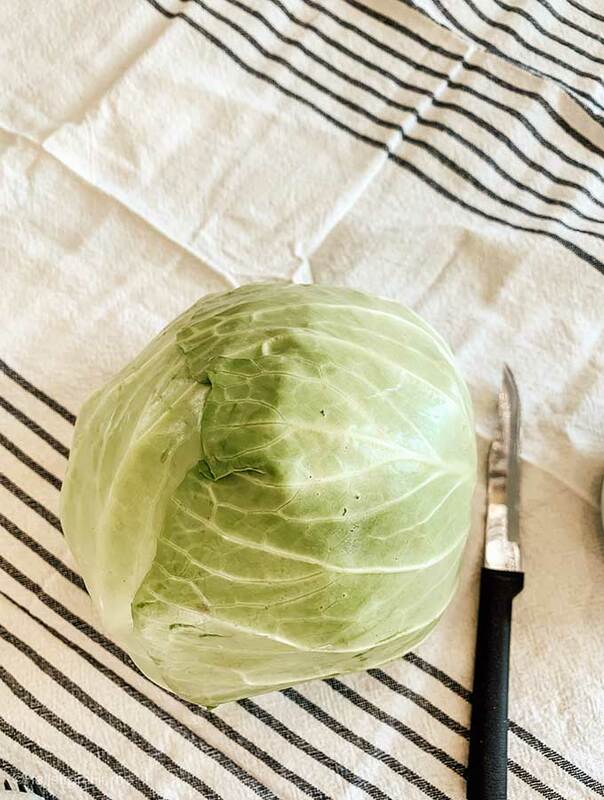 You’ll want to start by gently peeling back the outer layers of the cabbage. Don’t tear them off unless they are wilting or browning. Just peeling them back is what gives the cabbage a full look. I sure know my mother would love to get an arrangement like this one for Mother’s Day. But she doesn’t have to know how easy it actually was! Now it’s time to start cutting. I just worked at the cabbage until I got a hole big enough for my mason jar. It also has to be deep enough so you don’t get a little mason jar peeking out of your bouquet. It doesn’t have to be a mason jar, just anything that could hold your flowers and the water. 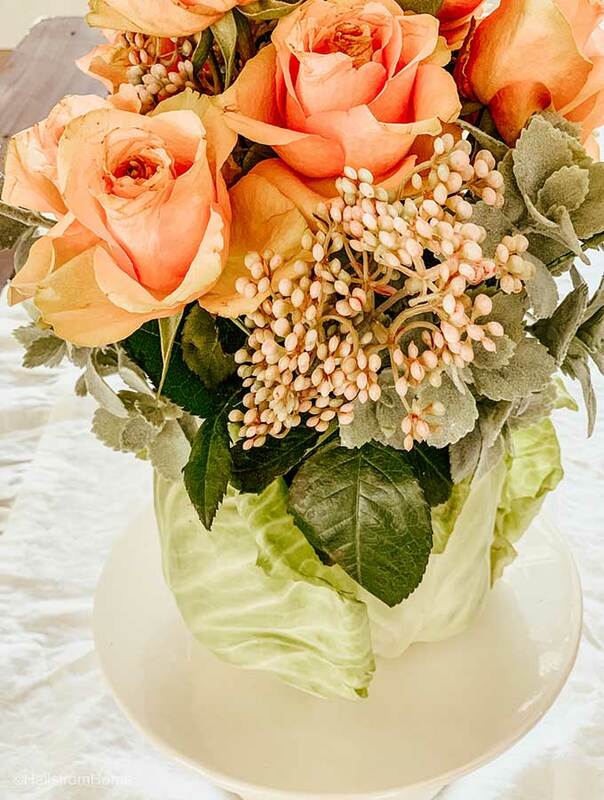 See how a Mother’s Day arrangement doesn’t have to cost a lot and also take a lot of time. Besides who doesn’t love something that is simple and gorgeous? Time for the flowers. I first started with just a simple bouquet of roses, which were very pretty. 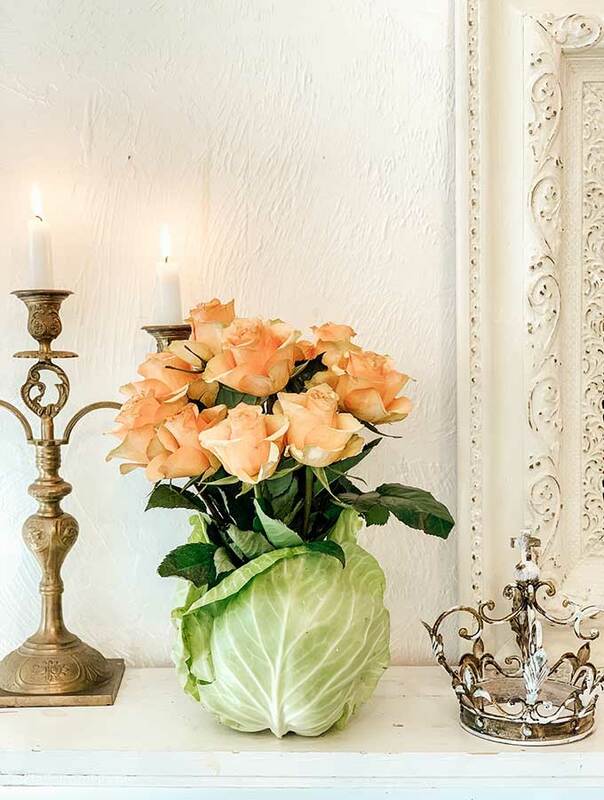 But I was thinking to add a few more elements to this cabbage bouquet. 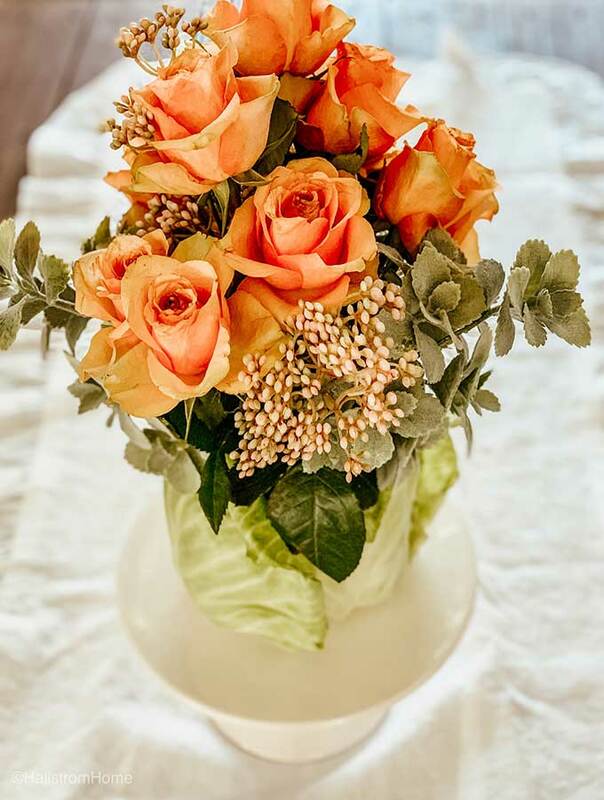 As you’ll see below the rose bouquet, it’s great for a pretty touch to any Spring tablescape. But then I changed my mind and decided I wanted to add more greenery. See how we decorating our farmhouse front porch to get ready for the Spring season. For the filler greenery I added some faux jade stems and some faux little berries. I got both of them from the Magnolia Home collection at Target. Have you guys ever looked at it? 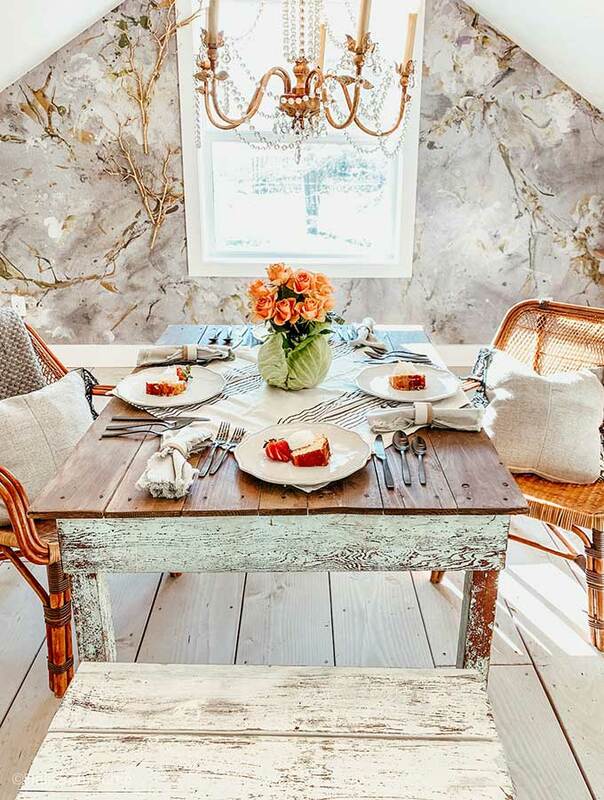 Well I think I love every single piece, but if you want to see my absolute favorites you can shop the my Magnolia collection here. I thought the greenery was the perfect touch to add to my Spring tablescape. For my Spring table I didn’t add much to it. I really wanted to keep it simple and easy, if you follow me on Instagram you know that’s what I do best. Speaking of Magnolia, have you gotten the new Magnolia Table cookbook? I highly recommend it! See the lemon bundt cake on the plates, that’s from Joanna’s cookbook. But I added my own little twist to the recipe so go check it out! 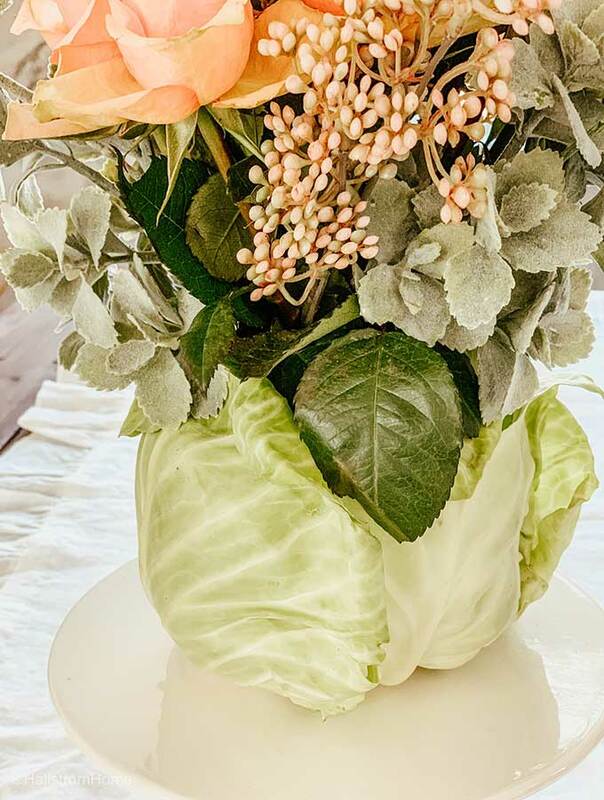 Should I refrigerate my cabbage flower arrangement? Yes, in the evening I would place this in the fridge. It will help keep the cabbage from wilting. Or another option is to place wet paper towels around it and that could also help prevent wilting. How long does this arrangement last? If you keep refilling the water it should last about 5-7 days? Can I use floral foam instead of a mason jar? Yes! Just also make sure you water it every couple of days. I just love, love, love it! YOU ROCK! I absolutely love how unique and adorable this is! Yes, sounds easy once you explained about the mason jar! I’ve been waiting for your directions on this. Thank you! It’s beautiful! Thanks Nancy! It’s a lot of fun to make!